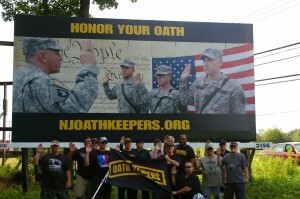 During the 2nd half of 2015, New Jersey Oath Keepers created this billboard just outside the joint base McGuire-Dix-Lakehurst (JBMDL) in Lakehurst, New Jersey. While we are still accepting donations through an arrangement with the American Bedrock Foundation PayPal account, we are currently reevaluating our “Reach, Teach, and Inspire” (RTI) initiatives for 2017. Your suggestions for location and content are welcome.